1) The first "occupation" (trespass, theft) of the Douglas Creek Estate (DCE) property while homes were under construction in 2006 and obtaining said lands from the legitimate owners by fraud. 2) The extortion committed against the people of Ontario resulting in handing over the Burtch Correctional lands in Brant County to the Six Nations occupiers as a bribe to get them to remove the first Argyle Street barricade (in 2006). 3) The illegal erection of another barricade (using the same stolen Ontario One hydro tower) across Argyle Street South in Caledonia in 2017 as a result of an internal dispute between the Hereditary Council (no legal status on Six Nations) and Elected Council (the legal representatives of Six Nations). Note that this map dated 1842 was received by the Department of Indian Affairs in 1896. As the marginal note on the right indicates, the Indian Reserve as agreed upon in various Council Meetings was the line running between B and E. The Plank Road is shown as a red line running diagonally north - south. The "tier of lots" noted in the above documentation refers to the lots situated between the Plank Road on the west side, and running west to the line marking the eastern boundary of I.R. 40, the Six Nations Reserve. In effect this is the wedge shaped area bounded by D to C (along the Plank Road), and B to E (present day boundary of Six Nations Reserve) (LAC, RG10M 78903/78, Plan of part of the township of Oneida, date 1842 , Online MIKAN no. 3669668). ﻿ The DCE property is within the Lot labelled C along Plank Road south of Caledonia where Sixth (6th) Line joins the Plank Road. In the modern Google map above Oneida Road is the line from E to B in the above 1842 map (the border of the Six Nations Reserve), Argyle Street South (Plank Road, Old Highway 6) is the line running from D on the Grand River beyond McKenzie Creek (the flooded area in the 1842 map) to letter C (where Hagersville is today). 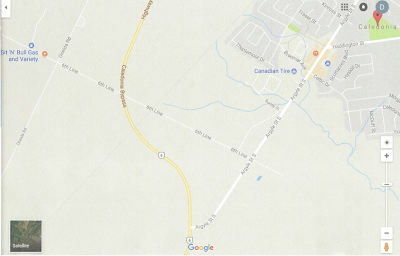 The DCE property is on both sides of Surrey Street west of the forked creek (Douglas Creek). Conclusion: Evidence, data, facts, proof, no matter how persuasive; and the concept of "beyond a reasonable doubt" or even the law itself, simply do not override political correctness and the unsupported view of "Natives" (although Six Nations are 1784 refugees from what is now New York) as victims. So with a police "force" and two levels of Government who would rather operate as a flock of ostrich with their heads in the sand than confront these aggressors with the facts as shown above - we in Caledonia are beat - and the concept of one law for all citizens becomes a travesty, a sad sick joke in Canada.